I would like to wish all of those moms out there a Happy Mother's day. I do have an old pic of me and my mom to share. 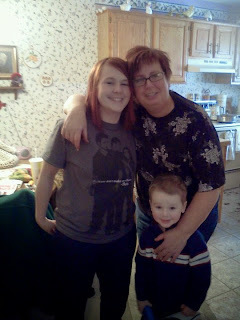 This is my Mom, G, and I taken at my Grandmother's house around 4 years ago. So how was your Mothers Day? Were you spoiled by your kids? Treated like a queen? Or, was it like any other day after they gave you a card and small gift they went back to fighting like normal. Mine was fighting like normal but I know that if they behaved I would think that someone was dead lol. Z planted me some flowers at daycare. G gave me a bean. He didn't get it when I asked him what he traded for such a wonderful magic bean lol. K is your typical high school boy and just went with D to Walmart and bought me a new backpack. I have never had a hydration pack before so I am kinda excited to go hiking again. We did go to Menards to buy more plants for the garden and everyone but K helped plant this time. I am taking pics and in Cindy land that is helping. Because I am unemployed we decided to forgo the eating out thing and decided to watch a movie and order pizza instead. I still have no regrets on quitting my job.